Note: Amador closed in May 2015. Chef Juan Amador is planning to open a new venture in the near future. My first meal at Amador was 6 years ago in 2008. Obviously I don't remember all the details of that multi-course meal, but one dish is forever imprinted on my mind. It was Juan Amador's interpretation of 'Strammer Max' (a traditional German ham and fried egg sandwich), where the ham came in the form of a liquid ham jelly, served in a small tube/straw. Juan Amador (b. 1968), son of a Spanish immigrant, started his career in his early twenties training in some of Germany's top Michelin starred kitchens, such as restaurant Imperial at Schlosshotel Bühlerhöhe in Bühl (Black Forest) and restaurant Waldhorn in Ravenburg (Upper Swabia). 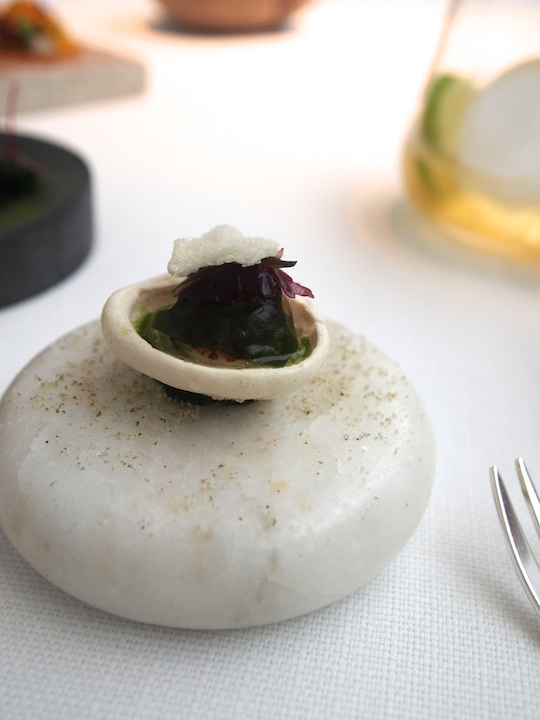 In 1993 Juan Amador was awarded his first Michelin star at Restaurant Peterselie in Lüdenscheid. Later on, in 1997, he became head chef at Restaurant Fährhaus Munkmarsch on the isle of Sylt and again the restaurant was awarded a Michelin star. His last stop before opening his own restaurant was at Schlosshotel Weyberhöfe in Sailauf (Bavaria), were he was awarded a Michelin star in 2000 yet again, and a second star followed in 2002. 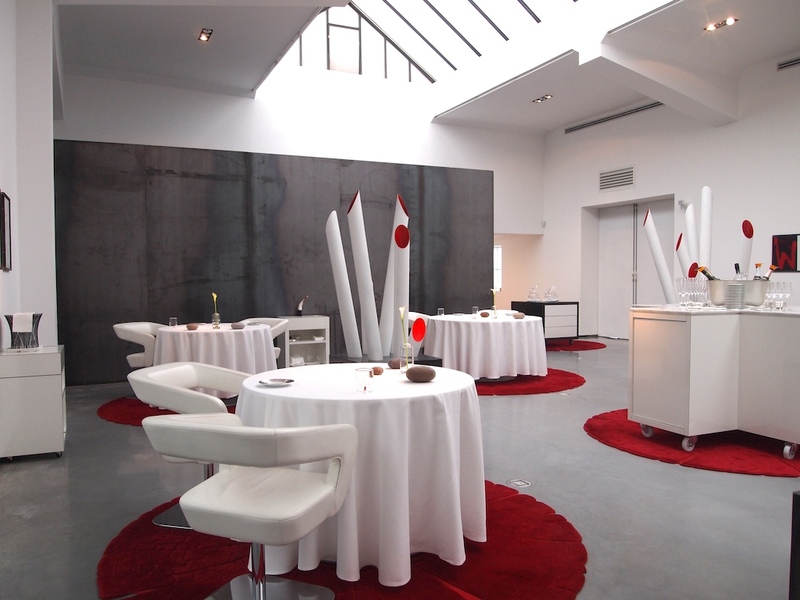 In 2004 Juan Amador opened his eponymous restaurant in Langen and in November 2007 already, the restaurant was awarded 3 Michelin stars. 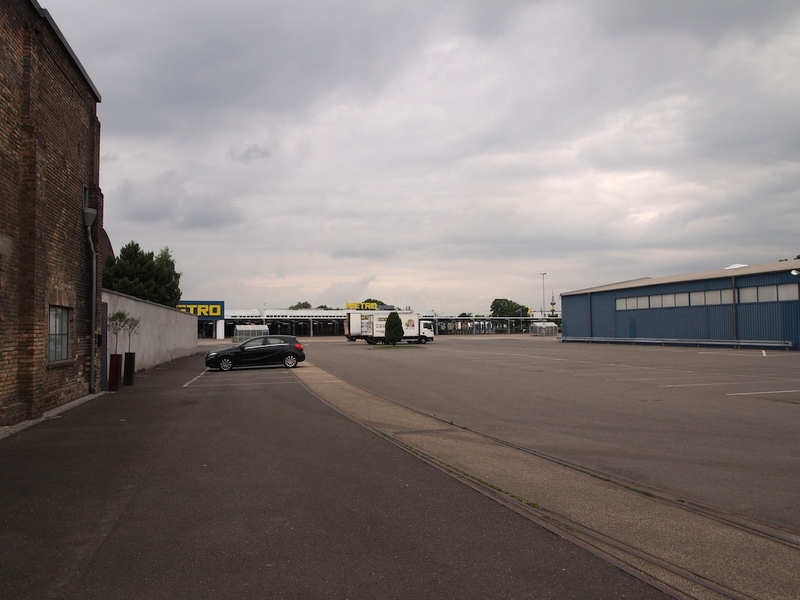 Three years ago the restaurant was relocated to a completely different setting in Mannheim. Where the restaurant in Langen was housed in a traditional German half-timbered house, the restaurant is now situated on an industrial estate, occupying a building hat was once part of the world-famous Schildkröt toy factories. When you arrive at the restaurant for dinner, the urban desert feeling generated by the nearby, closed Aldi and Metro shops with their desolate, empty parking lots is almost overwhelming, but once you go in, you enter a serene world, an oasis filled with modern art. 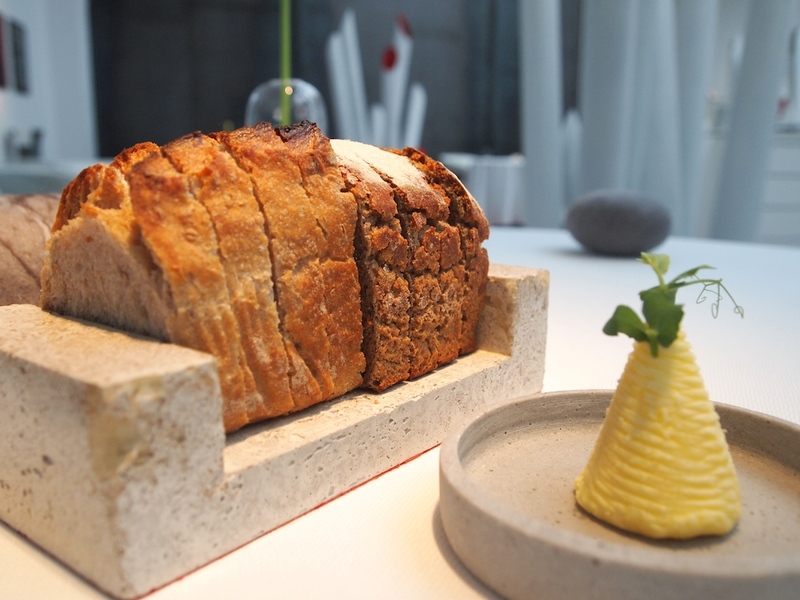 It is a stark contrast and quite an experience in its own right, and probably the closest thing to a three-star 'speakeasy' anywhere in the world. Amador is opening for dinner Tuesday till Saturday and you can choose between a 'small' tasting menu (3 courses + tapas/snacks and petit fours for €110) and a 'large' tasting menu (8 courses + tapas/snacks and petit fours for €230). I had dinner at Amador with my husband and a friend and we all ordered the large tasting menu. Dinner started with four appetisers. 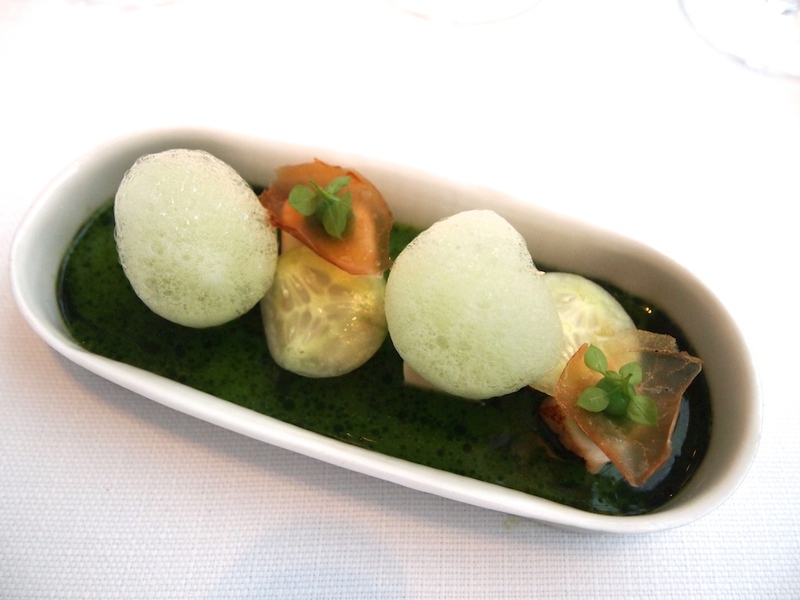 There was petoncle (a type of scallop) with marinated cucumber, algae and parsley puree, served in an iced 'shell' made from soy milk and tofu. 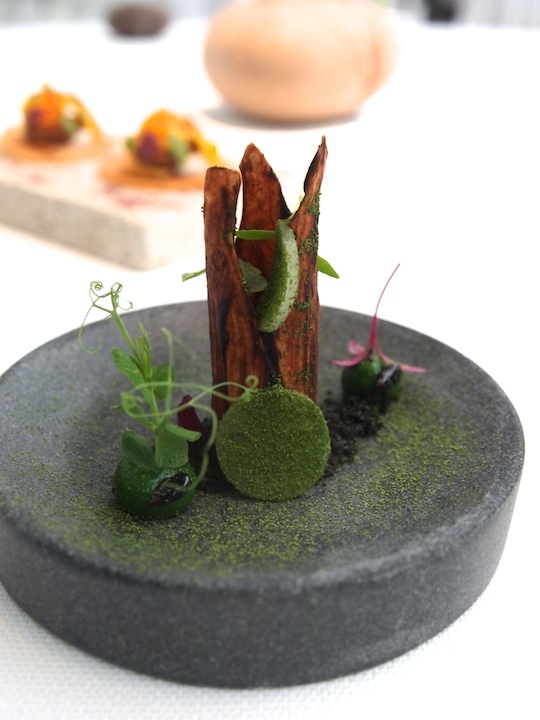 This was followed by 'Heaven & Earth', an edible stem (made from strudel pastry) with pear, parsley puree and blood sausage crumble; 'Chicken Bombay', a crisp cracker with guinea fowl, mango and coconut and curry puree and finally an edible 'twig', covered with lime, almonds and puffed couscous. Four splendid and artistically presented appetisers, with creative texture and flavour combinations. The first course of the tasting menu was Oyster, Morello cherries, Joselito ham. 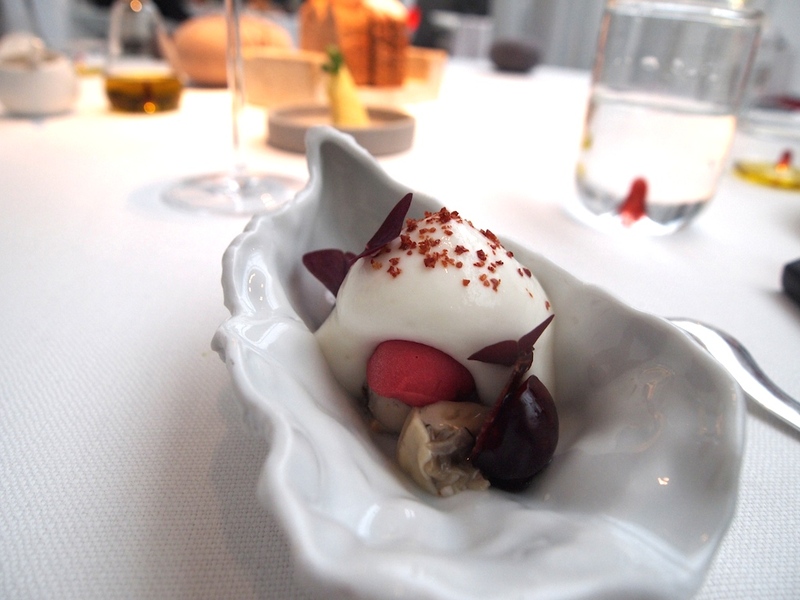 Large pieces of chopped oyster (Gillardeau no 2) served in the shell, accompanied by fresh, halved cherries, crisp Joselito ham discs, cherry sorbet, a wonderfully creamy and frothy verbena espuma, and sprinkled with some dried Joselito ham crumbs. A lot was going on 'in the shell' but the flavours worked. Great interplay of fresh flavours, textures and temperatures. Lovely briny sweetness from the fresh oyster, that enhanced the flavour of the cherries, and the ham gave the dish a nice warm finish. This was followed by tender and sweet scallops, served with cubes of 'iced' Hollandaise, dried scallop crisps, a cucumber, parsley and dill puree, and a cucumber and dill 'Sud'. In German cuisine the term 'Sud' is used for all sorts of vinaigrettes, broths and pickling juices. In this case it was a bit like a vinaigrette, the cucumber and dill being wonderfully concentrated, and the Sud had a well-judged touch of acidity. The iced beurre blanc was truly amazing and delivered a fantastic temperature contrast, and flavourwise it was a great blend between creaminess and sharpness. A very texturial dish with incredibly pure flavours, the acidity from the beurre blanc and the Sud really lifting all the other flavours. 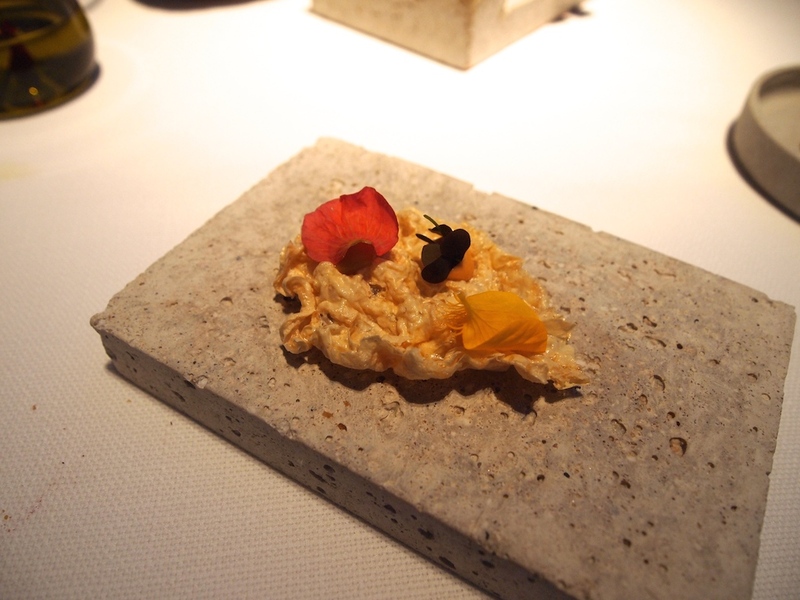 Third course was an artistically presented dish of Foie gras and langoustine described on the menu as 'Mar y Muntanya', Catalan for sea and mountain or 'surf and turf'. 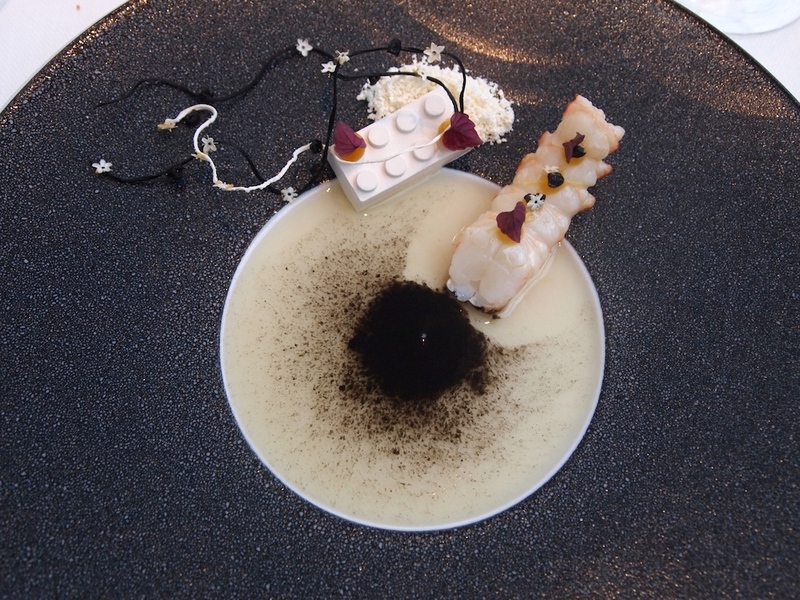 On the plate was an elegant foie gras mousse disguised as a white lego brick, some grated foie gras, a wonderfully succulent langoustine and a sweet elderflower 'Sud' with black olive dust. 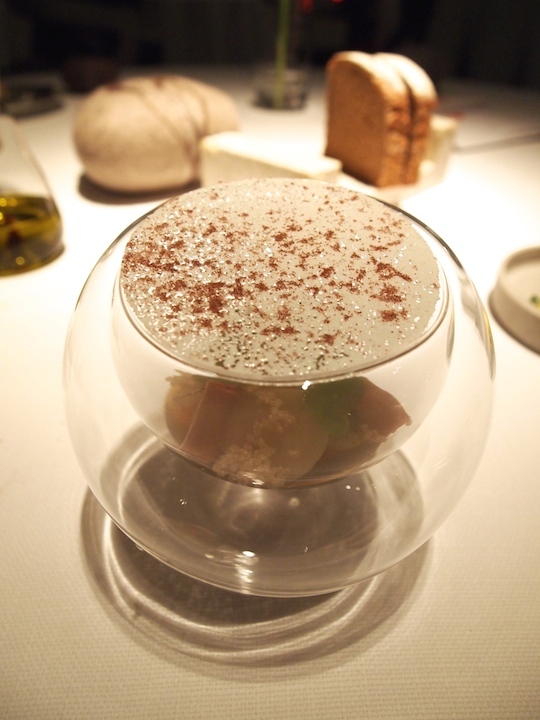 The aromatic elderflower Sud was intensely sweet, like a syrup, but it had lovely characteristic floral notes and the sweetness was somewhat tempered by the black olive and the foie gras. Overall a good dish, but the elderflower syrup was a challenging element in this dish and was a little bit too sweet for my taste. Fourth course was chargrilled 'Mannheimer' asparagus, served with a creamy verjus sauce with drops of parsley oil in it, a smooth and pure pea puree, mushroom crisp, soft quail's egg, 'potato soup' puree (shaped into a potato), sorrel leaves and an intense and nutty morel mushroom puree that had a lovely touch of acidity. 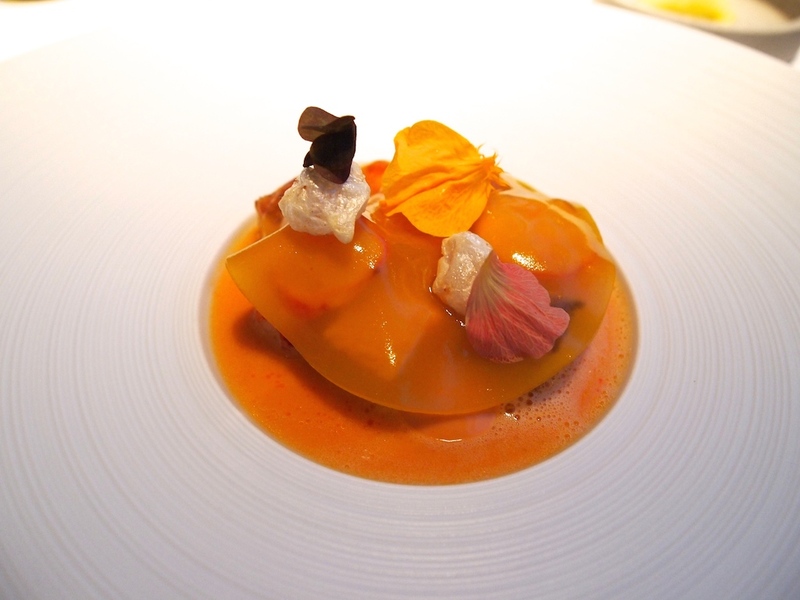 Both the egg and the puree were covered with crunchy Cecina de Leon ham for extra body and texture. A brilliant dish with an extraordinary balance between richness and lightness, which was accomplished by the clever use of acidity, which mellowed the richer flavours and also gave the dish a wonderful clean finish. On to the fifth course: Pork belly, lobster, pork crackling, yellow peppers and pineapple. Pieces of beautifully tender and mildly sweet pork belly and succulent lobster and cubes of sweet, caramelised pineapple, hidden underneath a jelly disc made from yellow peppers, and served with an elegantly smoky shellfish, yellow pepper and saffron sauce. Between the pieces of lobster and pork belly were two crèmes, one made from shellfish, that had a lovely intense finish, and one made from pineapple, which had a lovely smoky touch. An Indonesian emping cracker topped with pineapple, shellfish and saffron mayo was served on the side. A terrific dish with a great depth of flavour and an ideal interplay of sweet, bitter and sour flavours. Next to arrive was Pigeon with mango, coconut and purple curry (a mixture of warm oriental spices such as coriander, mustard, ginger, fennel and mace). This pigeon dish is one of Juan Amador's signature dishes and was offered to us by the restaurant as an extra course. I must say that generally speaking I am not a big fan of surprise/extra dishes. These extensive multi-course tasting menus are hard enough work as it is, but in this case I'm glad they included this dish, because it was truly spectacular. Tender and moist Miéral pigeon (from the Bresse region in France), covered with a thin and intensely aromatic crust of Gewürzbrot (the German equivalent of pain d'épice) mixed with piquant purple curry spices, finished with dots of coconut and mango puree and small cubes of fresh mango. 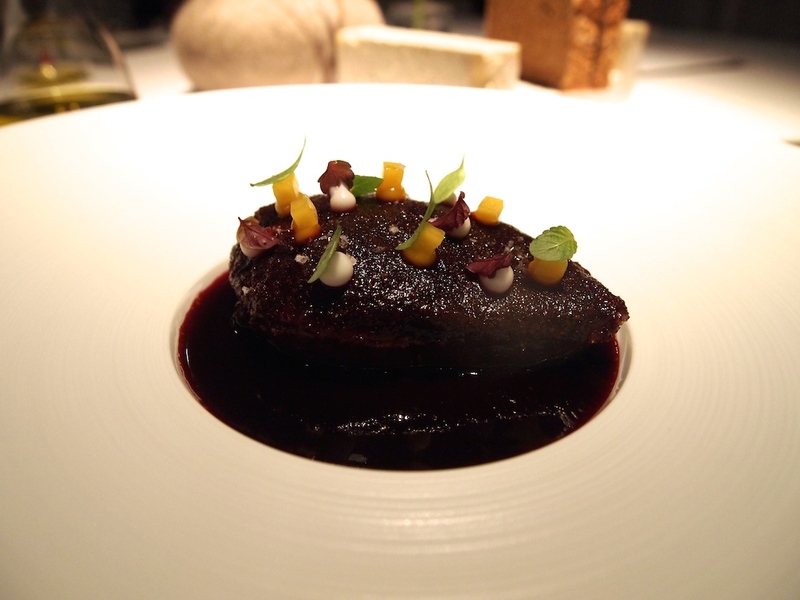 The pigeon was placed on a shiny, dark-red sauce, flavoured with purple curry spices. Roasted pigeon bones and port are used as the base for the sauce, which, after it's been reduced, is freshened up by some beetroot juice and Sauternes, resulting in a beautiful balance between sweetness and spiciness. 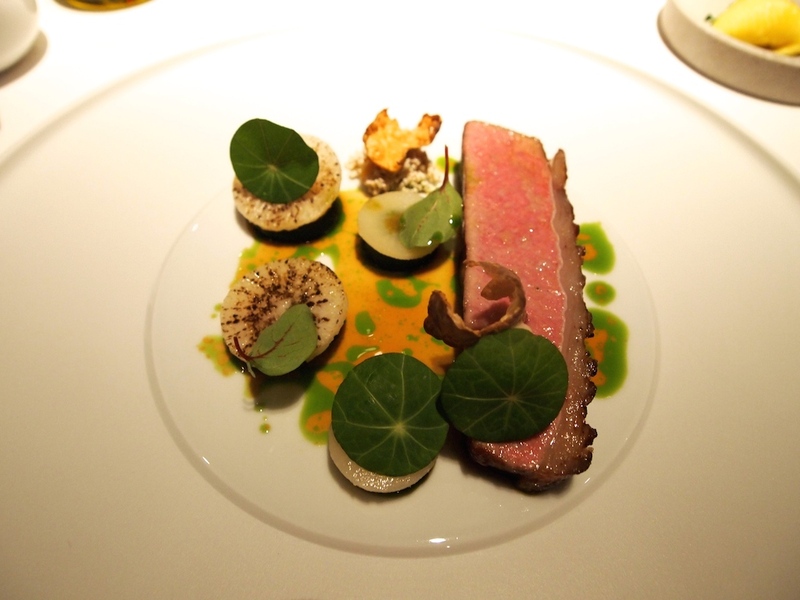 The main course of the menu (sixth course) was Lamb, sorrel, Jerusalem artichokes and radish. First to arrive was a glass bowl with a delicate lamb jelly, lamb tongue, crunchy sliced radish and a sumac caramel. The next dish had more intense flavours. There was a piece of succulent lamb fillet, Jerusalem artichoke puree and crisps, pickled white radish, quinoa, fresh sorrel leaves and sorrel puree, and a lamb jus spiked with dill oil. A lovely dish and the lamb was well-cooked, but the level of acidity from the sorrel and pickled radish was on the high side. 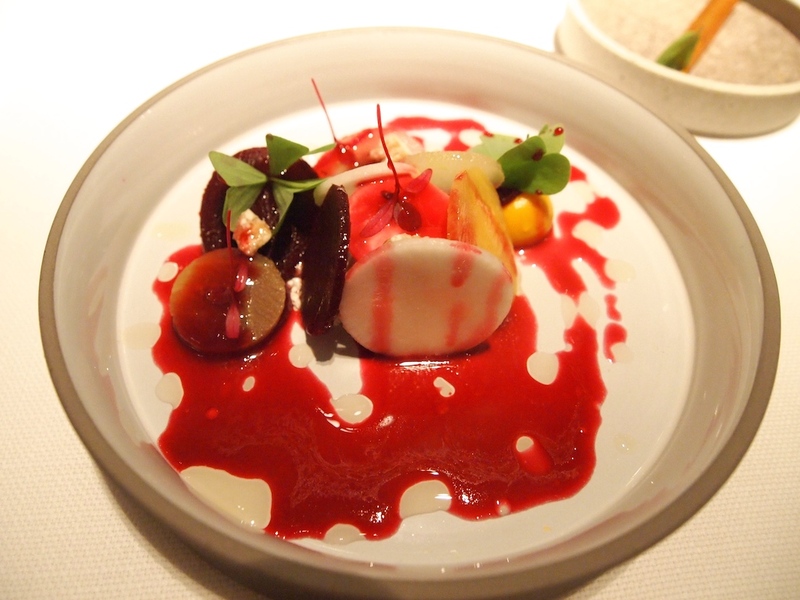 Seventh course was a savoury-sweet dessert of different varieties and textures of beetroot, served with a deliciously creamy Topfen (German quark) ice cream and a nice and sharp red cabbage sauce. A crisp yellow beetroot cannelloni with a carrot filling was served on the side. 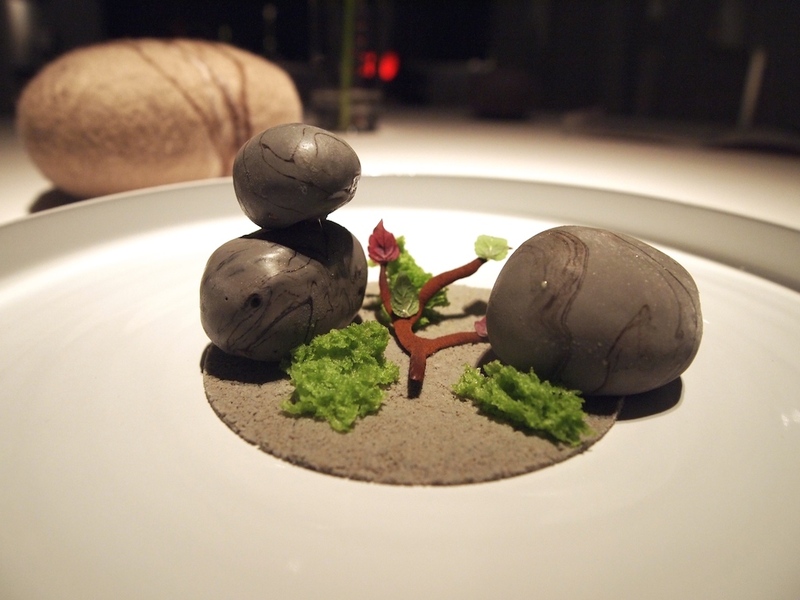 Last to be served was a dramatically presented dessert of three 'pebbles', pistachio sponge cake and dried cake crumbs 'soil'. 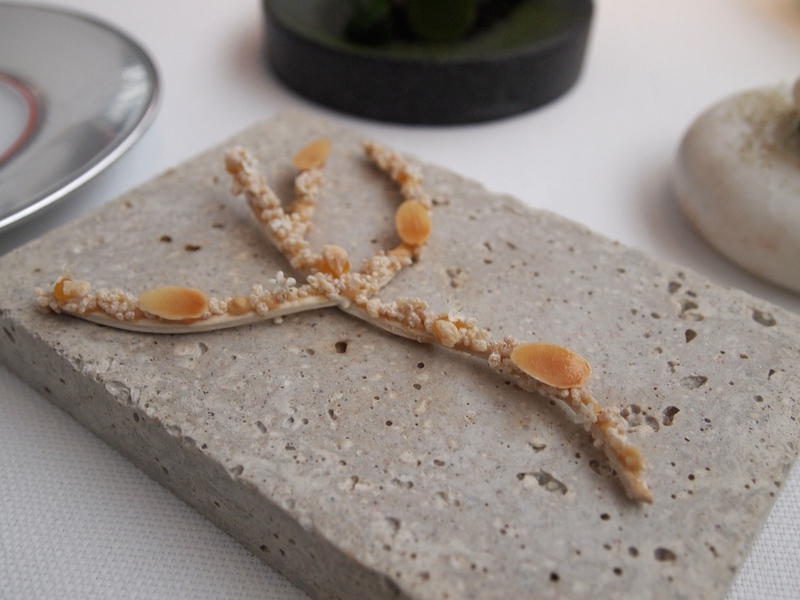 The pebbles had a wonderfully crunchy casing and each had its own filling, creating a delightful combination of textures and flavours. One was filled with a pistachio ice cream, one with an almond crème and one with a chocolate nougat mousse. The cake soil was made from almond milk, egg white and white chocolate. A well-executed dessert that displayed a lot of technique. 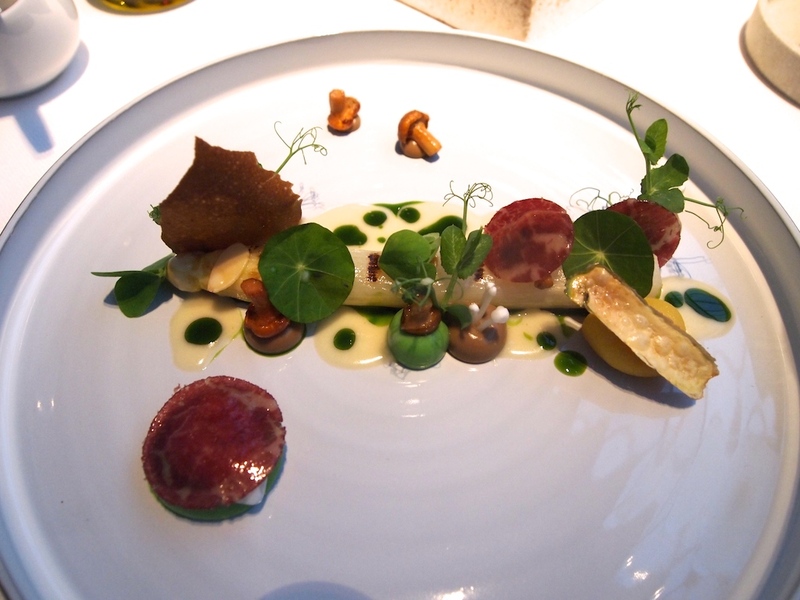 If memory serves, my dinners at Amador in December 2008 and September 2010 were full-on molecular dining experiences. 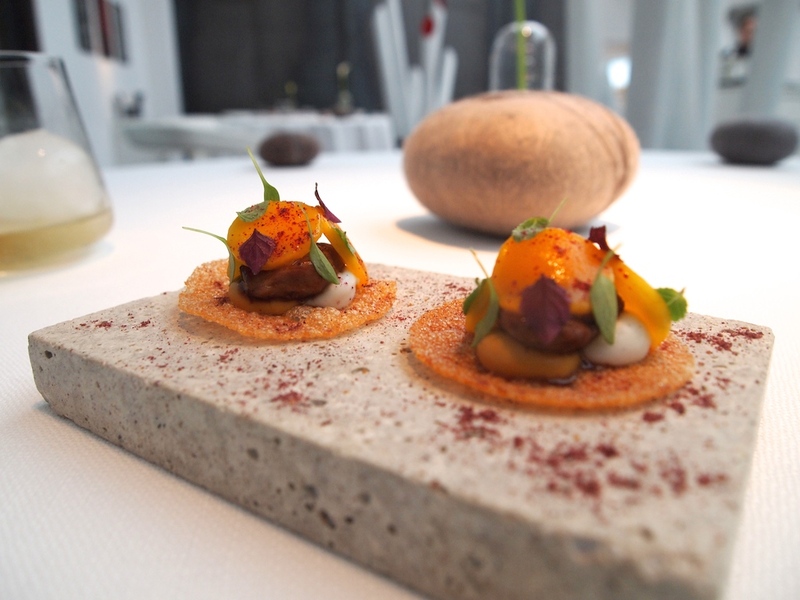 Almost four years later, it seems that Juan Amador has further developed his cuisine in a direction where molecular techniques are an integral part of his cooking but have a less prominent (or even dominant) role than before. What has stayed the same however, is that this is complex and cutting edge food, designed for maximum flavour and impact. Amador's food is characterised by risky combinations of flavours and ingredients, resulting in food that mainly stays within the lines, but where the dots don't always connect - which is precisely what makes it so attractive and exciting. The presentation is clean and precise and often of real artistic beauty. Service was excellent and sommelier Sascha Schömel proved an enthusiastic and expert pilot when we were trying to navigate the almost exclusively Spanish wine list, with its many choices from relatively unknown regions and/or producers. At Amador, both the chef and the restaurant deliver exciting and creative contrasts, a unique, heady mixture of Spain, Germany, the Orient and modern art.